SUB-SAHARAN AFRICA Ben Rothman, Dua Abedeen, John Waldo, Nudhbi Choudhury, Irene Elias, Colleen Fang Period 9 Garcia H4WX. 4 Spread of Agriculture in Sub-Saharan Africa. 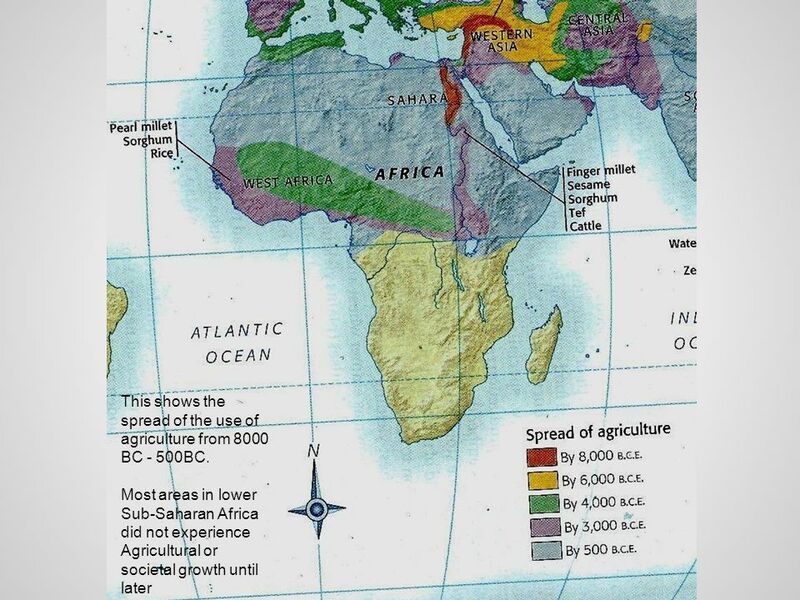 This shows the spread of the use of agriculture from 8000 BC - 500BC. 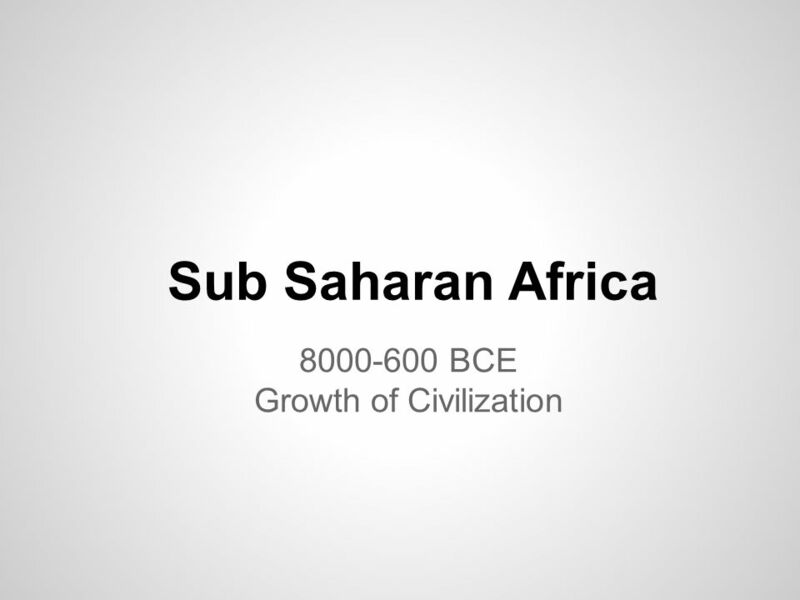 Most areas in lower Sub-Saharan Africa did not experience Agricultural or societal growth until later Spread of Agriculture in Sub-Saharan Africa. 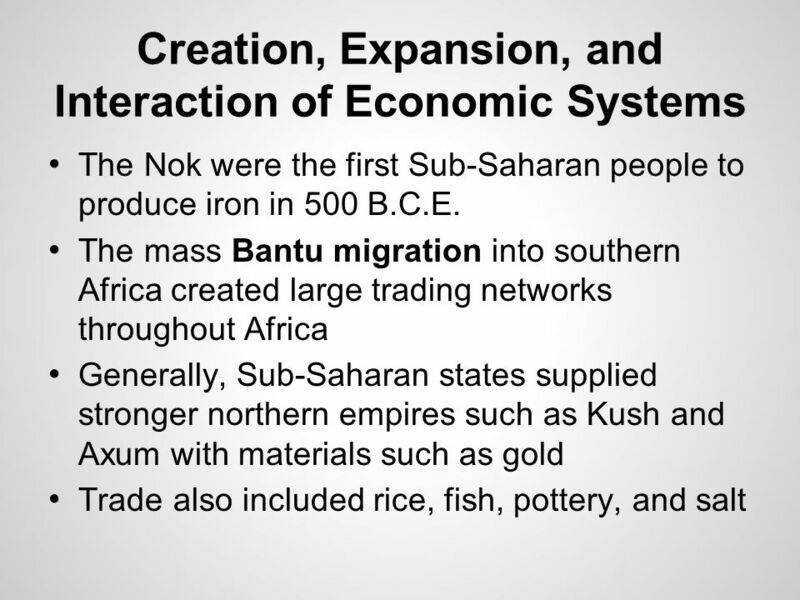 Beginnings of civilization (Nok culture may have been the first civilization in Sub-Saharan Africa around 1000 BCE) Agricultural revolution allowed the nomadic lifestyles to finish and allowed people to settle. Usually people settled near water and built farmland, rerouted water. 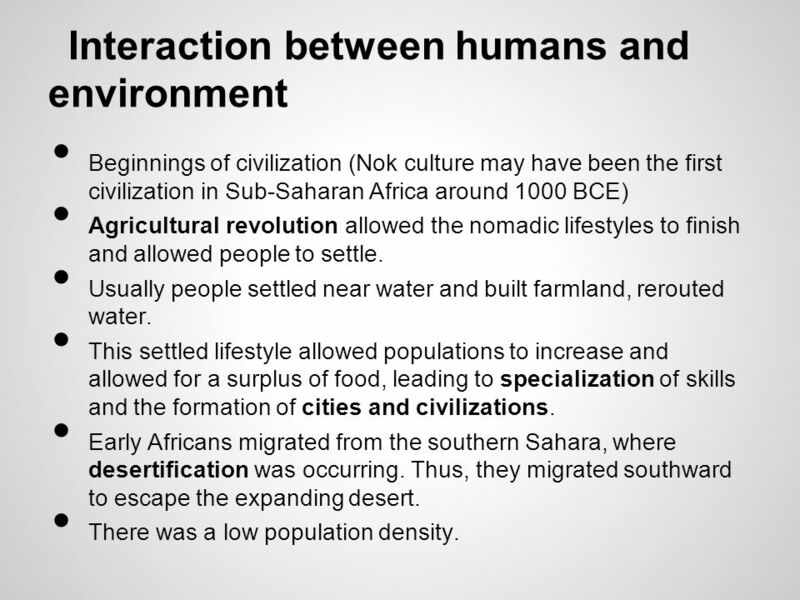 This settled lifestyle allowed populations to increase and allowed for a surplus of food, leading to specialization of skills and the formation of cities and civilizations. 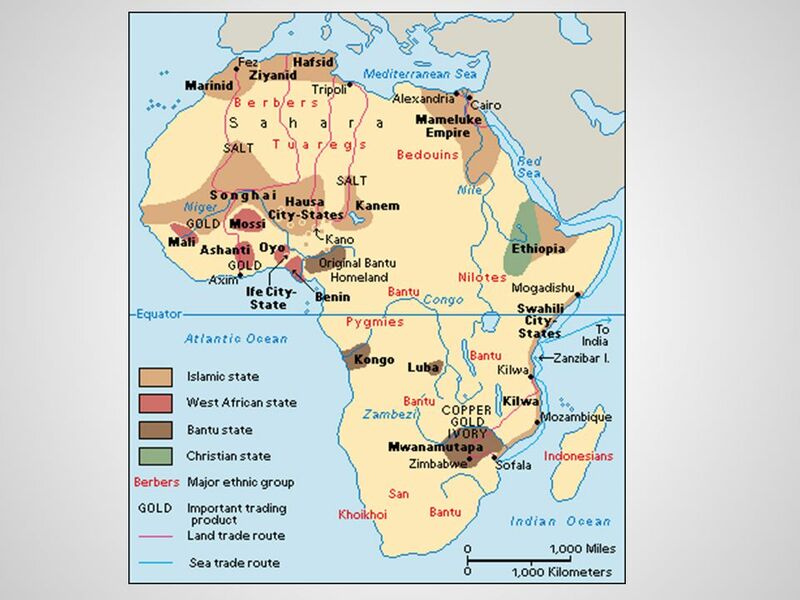 Early Africans migrated from the southern Sahara, where desertification was occurring. Thus, they migrated southward to escape the expanding desert. There was a low population density. Northern Nubia- in the 5th millenium B.C.E, people switched from hunting and gathering to a settled life based on agriculture and cattle herding. 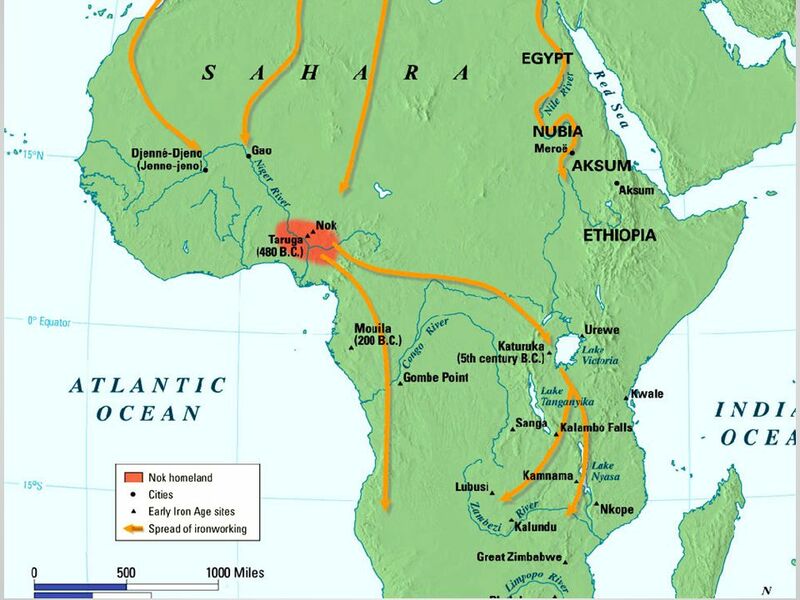 Bantu migrations ( BCE) - farmers moving from rivers in West Africa to the South and East, taking the land of nomads Jenne-Jeno - possibly first city in Sub-Saharan Africa, by the Niger River Valley Egypt occupied Nubia for a while, then the Nubians took over Egypt in 728 BCE. In between, the kingdom of Meroe developed. 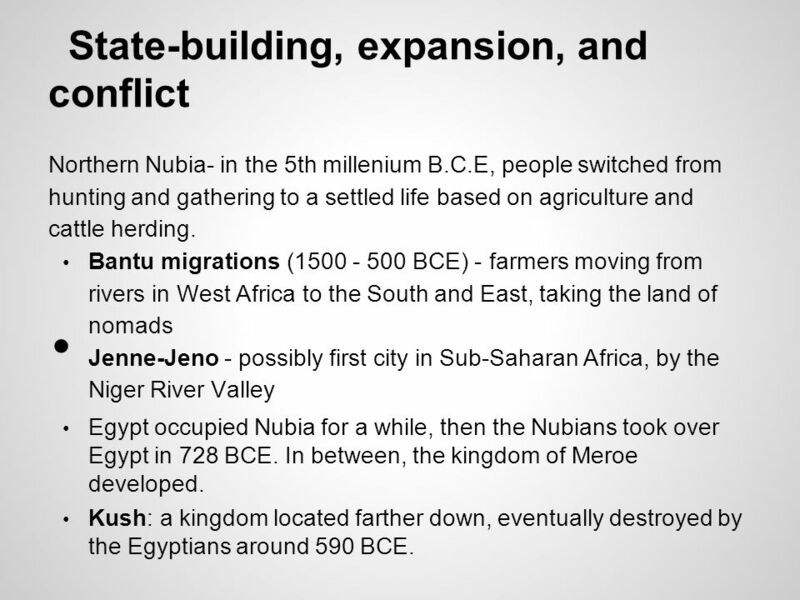 Kush: a kingdom located farther down, eventually destroyed by the Egyptians around 590 BCE. 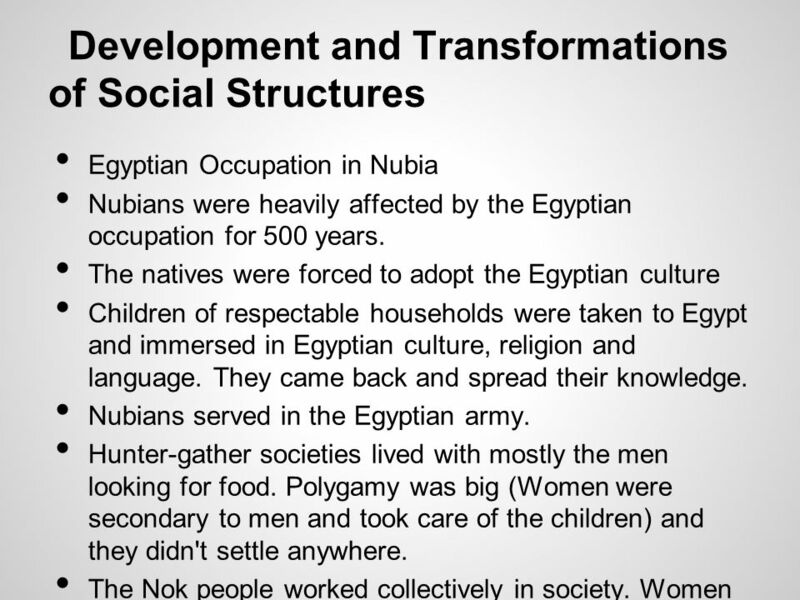 Egyptian Occupation in Nubia Nubians were heavily affected by the Egyptian occupation for 500 years. The natives were forced to adopt the Egyptian culture Children of respectable households were taken to Egypt and immersed in Egyptian culture, religion and language. They came back and spread their knowledge. Nubians served in the Egyptian army. Hunter-gather societies lived with mostly the men looking for food. Polygamy was big (Women were secondary to men and took care of the children) and they didn't settle anywhere. 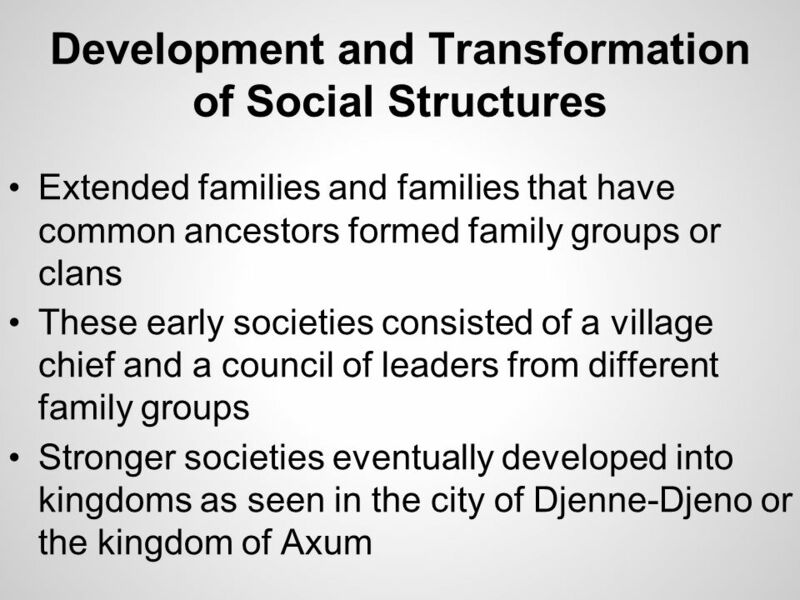 The Nok people worked collectively in society. Women were not as below men as in other societies. 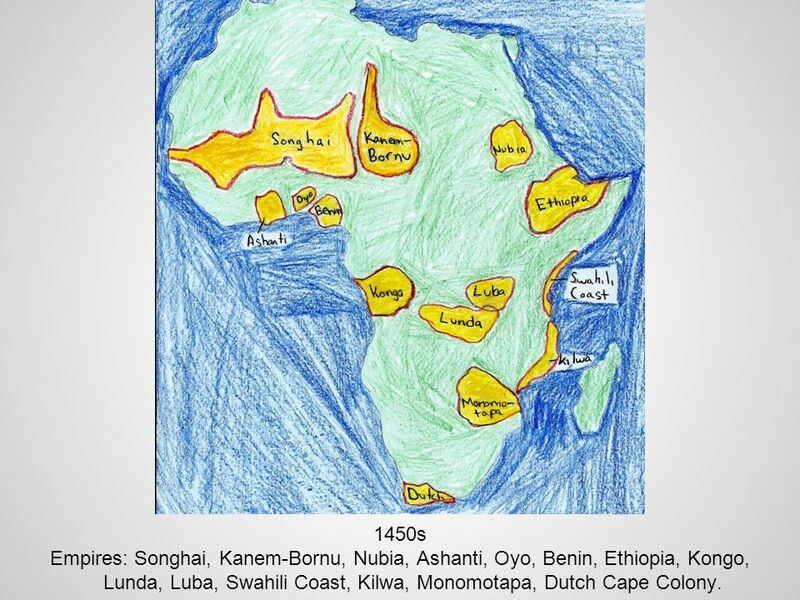 25 1450s Empires: Songhai, Kanem-Bornu, Nubia, Ashanti, Oyo, Benin, Ethiopia, Kongo, Lunda, Luba, Swahili Coast, Kilwa, Monomotapa, Dutch Cape Colony. 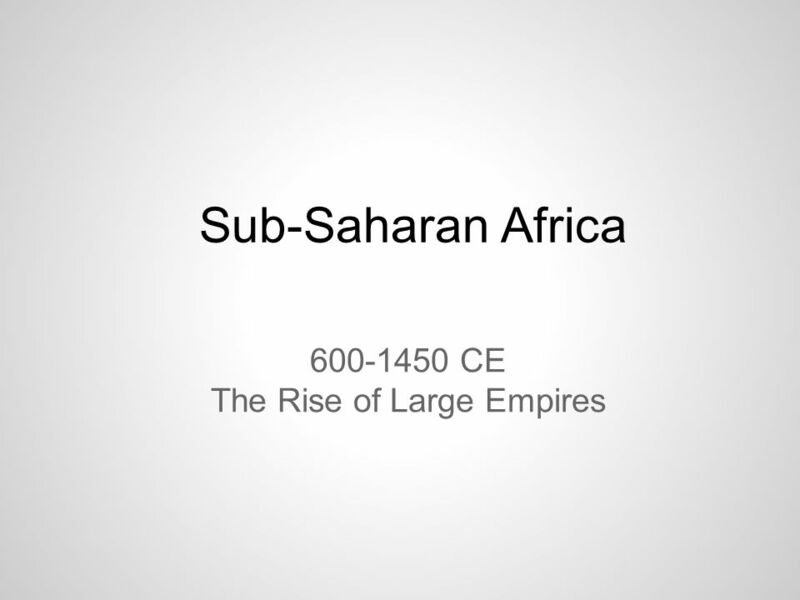 • During the 1400s, the Portuguese had been looking for a simpler and faster passage to the great trade routes of the Indian Ocean, when they discovered the riches of Sub-Saharan Africa. 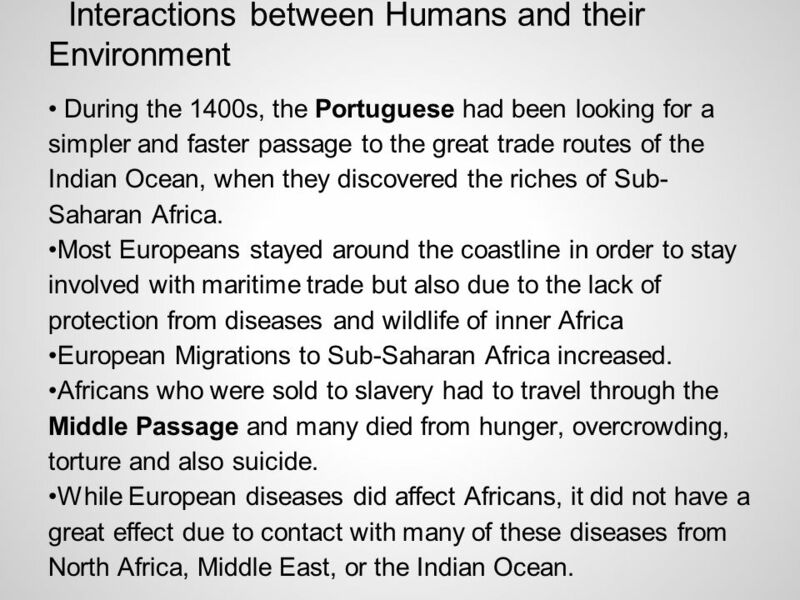 •Most Europeans stayed around the coastline in order to stay involved with maritime trade but also due to the lack of protection from diseases and wildlife of inner Africa •European Migrations to Sub-Saharan Africa increased. •Africans who were sold to slavery had to travel through the Middle Passage and many died from hunger, overcrowding, torture and also suicide. 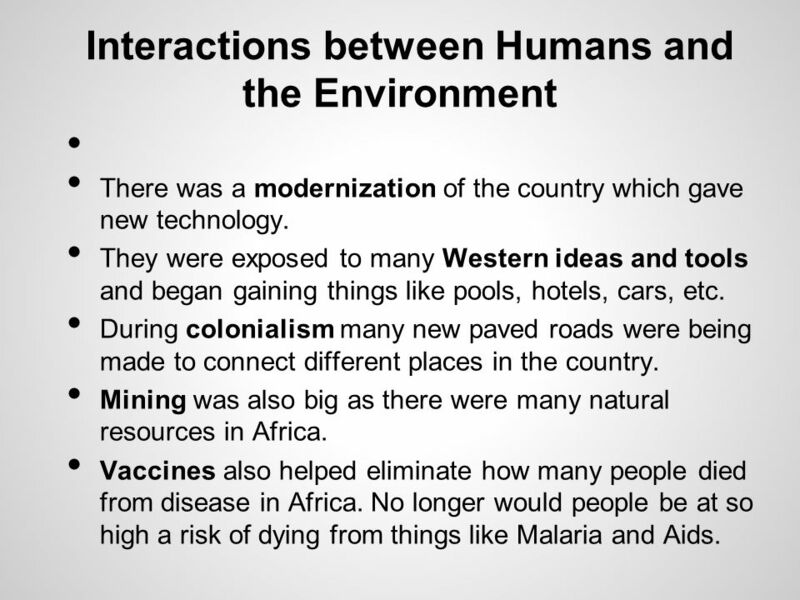 •While European diseases did affect Africans, it did not have a great effect due to contact with many of these diseases from North Africa, Middle East, or the Indian Ocean. 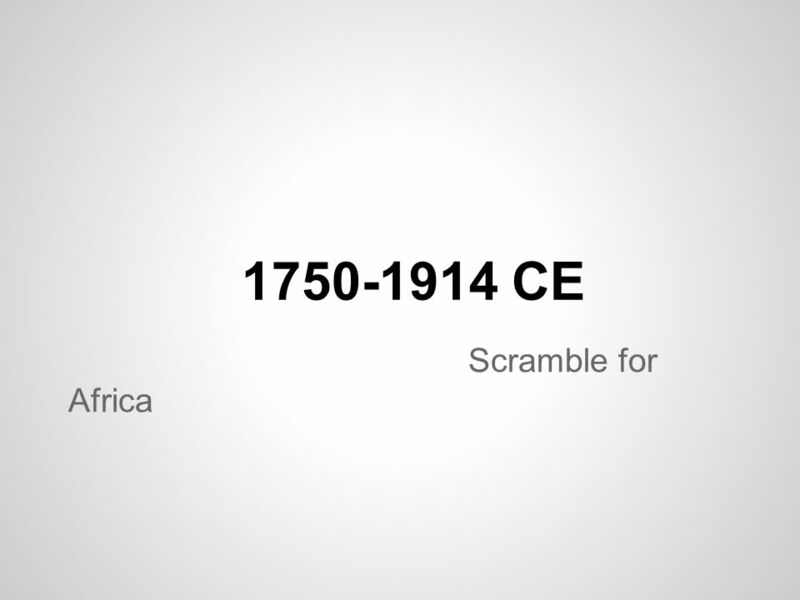 •Slavery had been a part of Africa since before the 1400s. 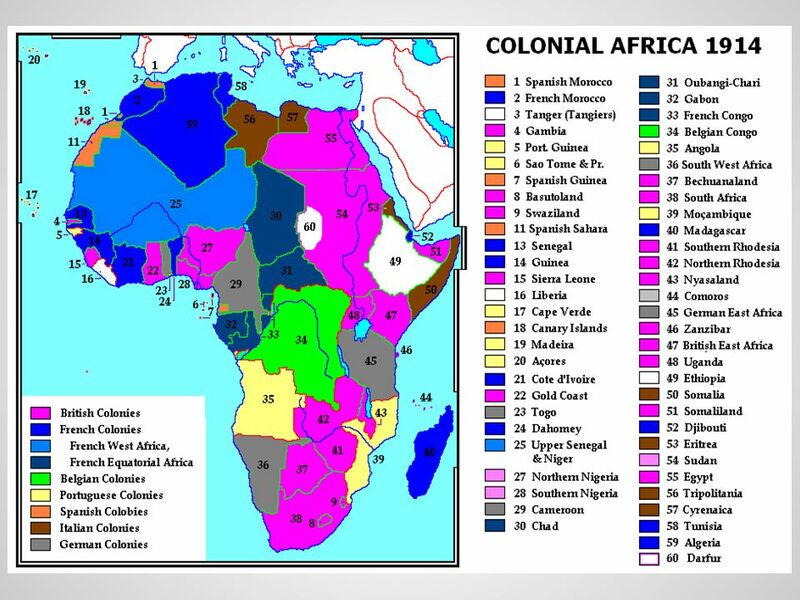 However, it was not until European presence grew in Africa and the Americas were beginning to be colonized did the trade grow drastically. 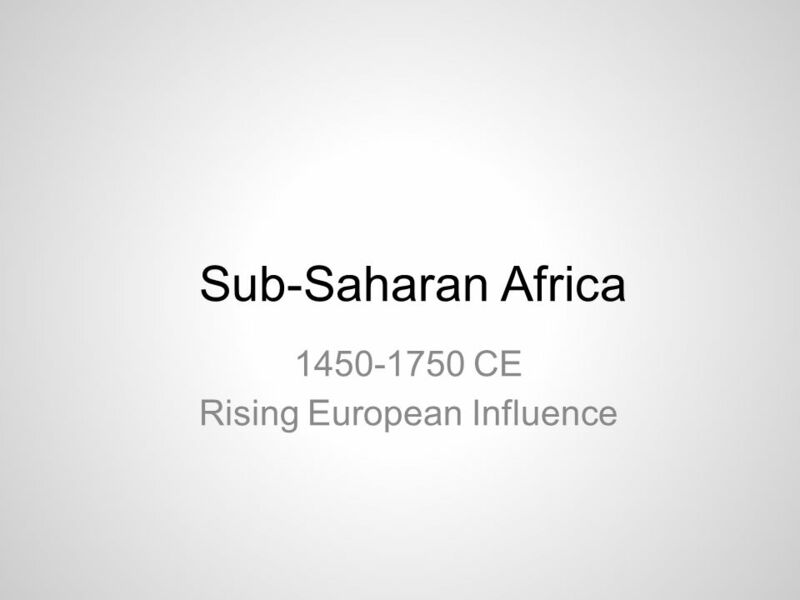 •The Portuguese and eventually other Europeans quickly became closely connected with the African people and its trades. 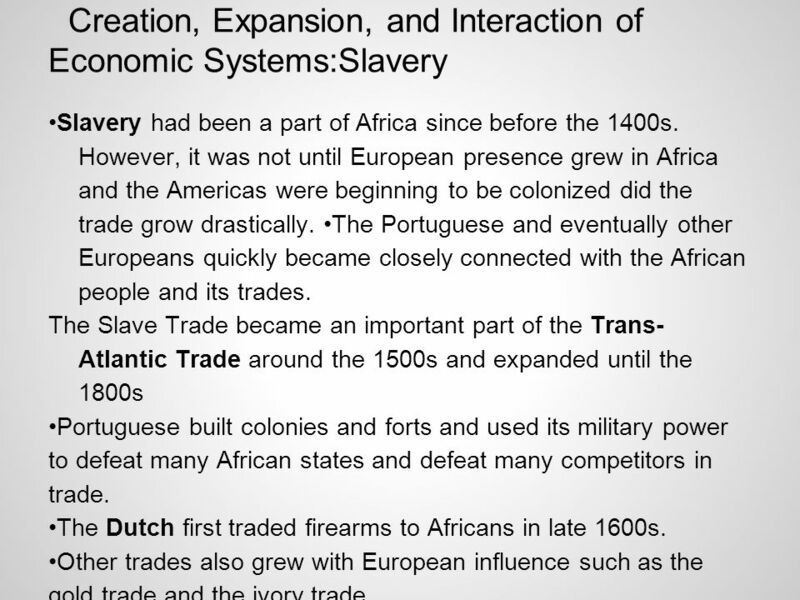 The Slave Trade became an important part of the Trans-Atlantic Trade around the 1500s and expanded until the 1800s •Portuguese built colonies and forts and used its military power to defeat many African states and defeat many competitors in trade. •The Dutch first traded firearms to Africans in late 1600s. •Other trades also grew with European influence such as the gold trade and the ivory trade. 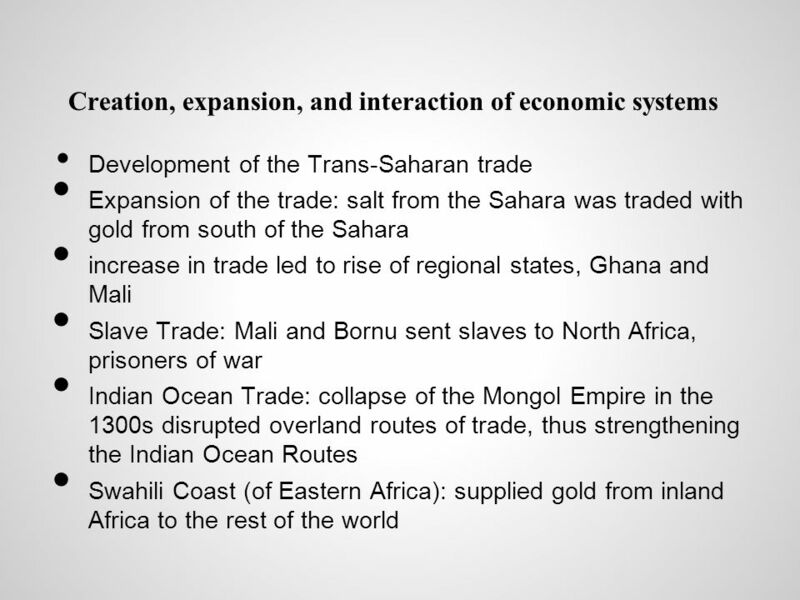 •Trade with the Indian Ocean, North Africa, and the Middle East continued. 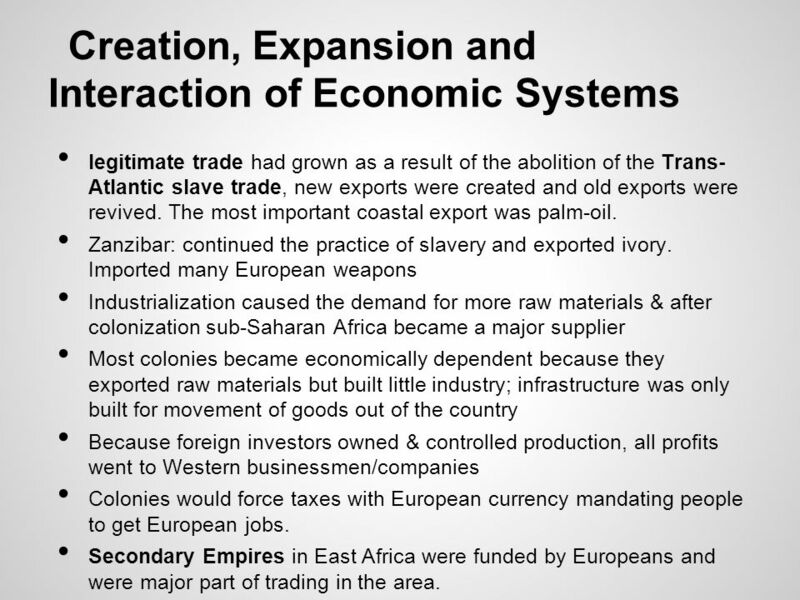 As the slave trade grew, so did economic and social disparity. Many families were destroyed by the abduction of people to sell into slavery. Abductions led to the drastic decline of the population in many states. Many aristocrats were also abducted leading to political dysfunction and eventually economic decline. However social classes stayed mostly the same. While there was a decrease in the male to female ratio the status of women did not make great progress. However women did take part in agricultural commerce. •There were some African Christian states in the beginning of the period, such as the Kingdom of Ethiopia and the Kingdom of the Kongo. •In the 1500s Christianity was making a rise due to missionary work. However, by the end of the period many Christian Africans were upset at how Christians can practice something as horrible as slavery such as in Congo, which led to the decline of Christianity in many empires. 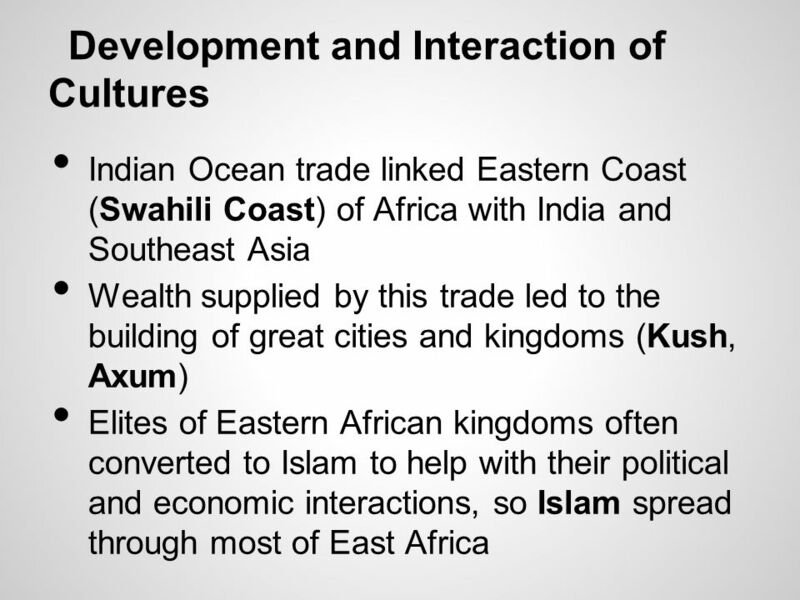 •Islam also increased its reach in Africa. In the 1500s and 1600s, the growth of Muslim empires, like the Ottomans, Kingdom of Sennar and the Kingdom of Adal Sultanate led to the spread of Islam. 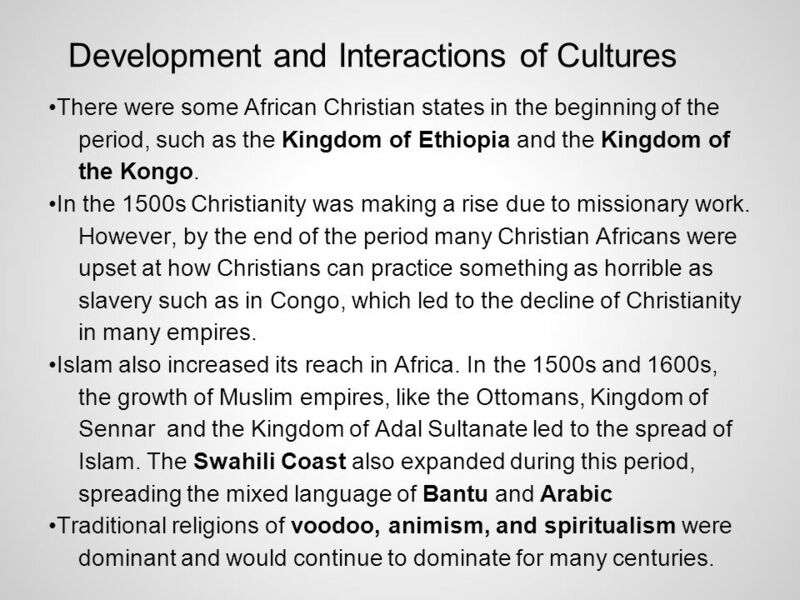 The Swahili Coast also expanded during this period, spreading the mixed language of Bantu and Arabic •Traditional religions of voodoo, animism, and spiritualism were dominant and would continue to dominate for many centuries. •The Songhai Empire grew largely in the beginning of the period, taking over the city of Timbuktu and spreading across the area of the Malian Kingdom. It fell in the late 1500s. •The Kingdom of Ethiopia in East Africa and Kingdom of Congo in Central Africa had been Christian for a long time. •The Kingdom of Zimbabwe had fallen around 1450s and was replaced by many smaller kingdoms including Portuguese colonies. 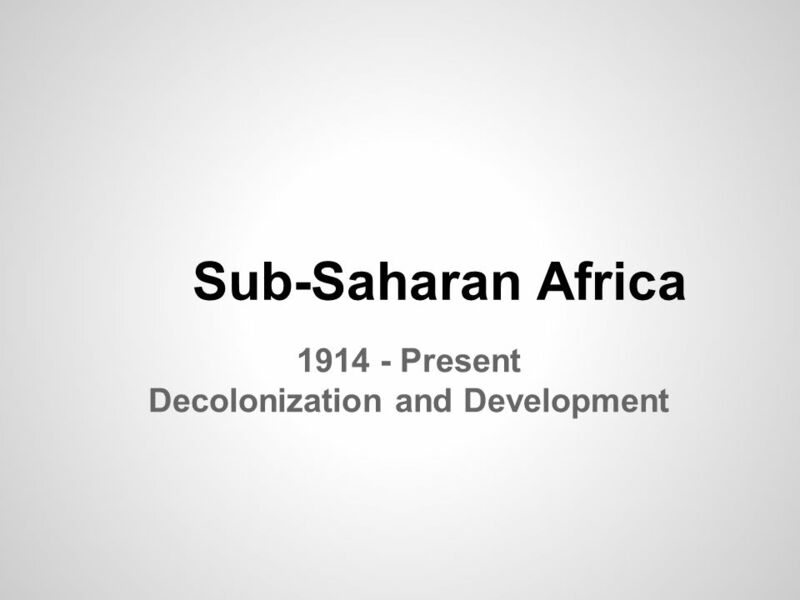 •The Swahili Coast expanded to a large portion of East African Coast. They were a major part of the Indian Ocean trade. 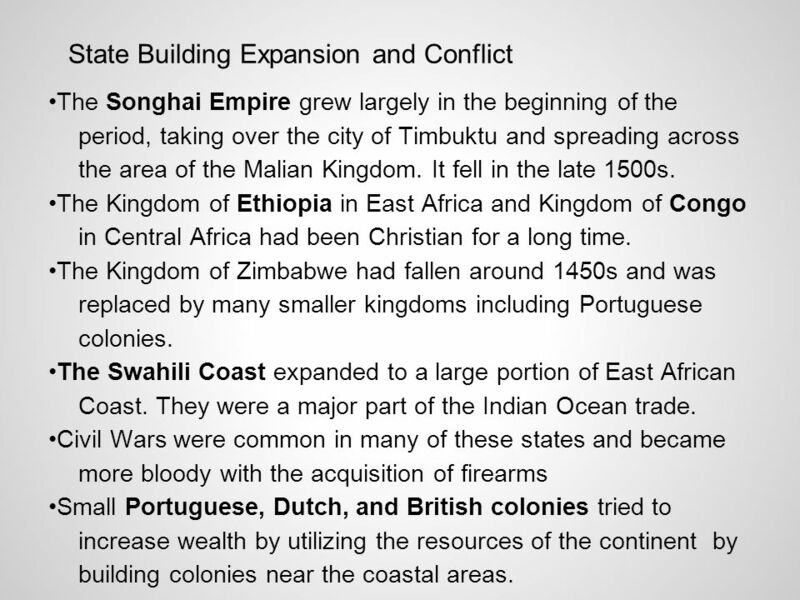 •Civil Wars were common in many of these states and became more bloody with the acquisition of firearms •Small Portuguese, Dutch, and British colonies tried to increase wealth by utilizing the resources of the continent by building colonies near the coastal areas. 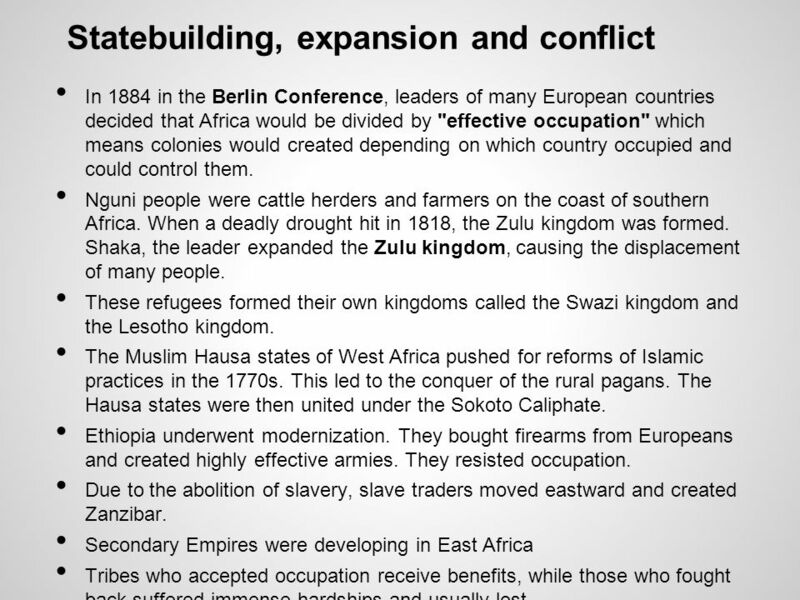 In 1884 in the Berlin Conference, leaders of many European countries decided that Africa would be divided by "effective occupation" which means colonies would created depending on which country occupied and could control them. Nguni people were cattle herders and farmers on the coast of southern Africa. When a deadly drought hit in 1818, the Zulu kingdom was formed. Shaka, the leader expanded the Zulu kingdom, causing the displacement of many people. These refugees formed their own kingdoms called the Swazi kingdom and the Lesotho kingdom. 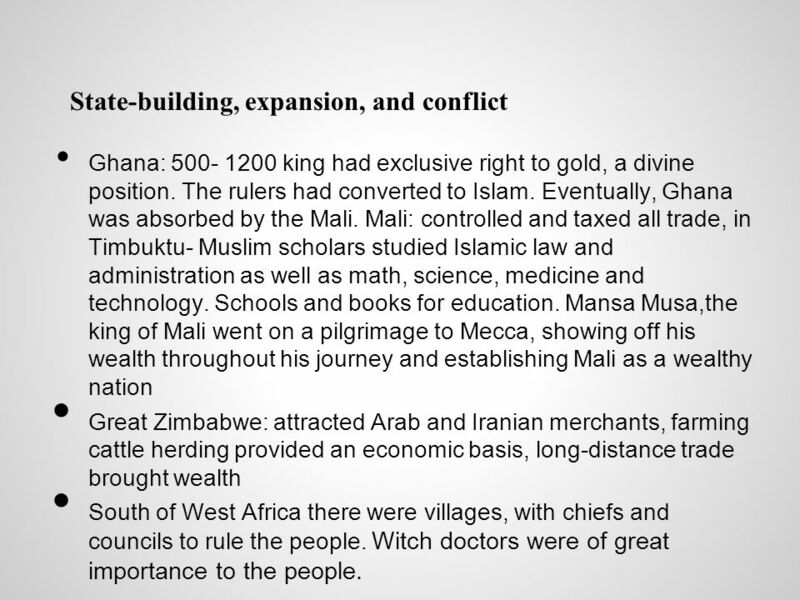 The Muslim Hausa states of West Africa pushed for reforms of Islamic practices in the 1770s. This led to the conquer of the rural pagans. The Hausa states were then united under the Sokoto Caliphate. Ethiopia underwent modernization. They bought firearms from Europeans and created highly effective armies. They resisted occupation. Due to the abolition of slavery, slave traders moved eastward and created Zanzibar. 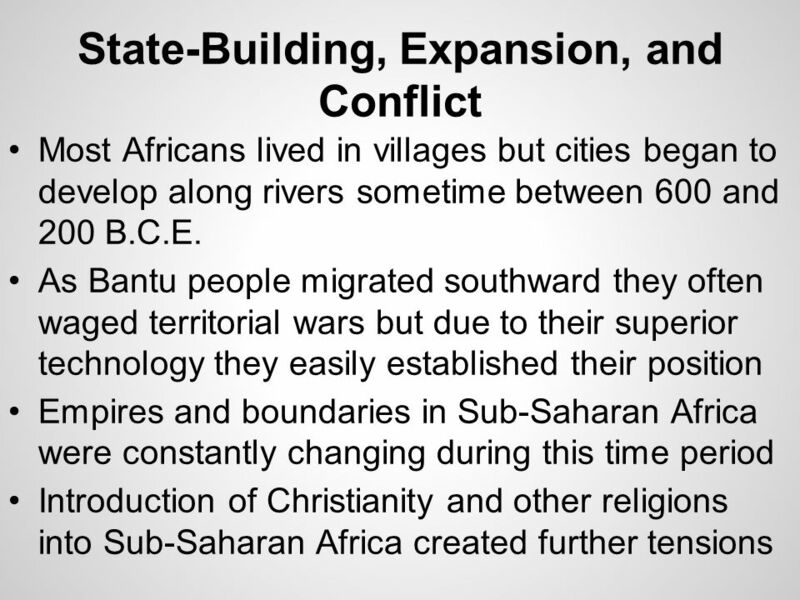 Secondary Empires were developing in East Africa Tribes who accepted occupation receive benefits, while those who fought back suffered immense hardships and usually lost. Many tribes and lingually connected regions were divided by the new borders developed by the Europeans. Population increased because of the end of the trans-atlantic trade, colonization and the spread of medical services. Indentured servants came in and left Sub- Saharan Africa. Many Africans had to move to cities for jobs. Resources were starting to be extracted at a greater scale. Roads and other technology were used. 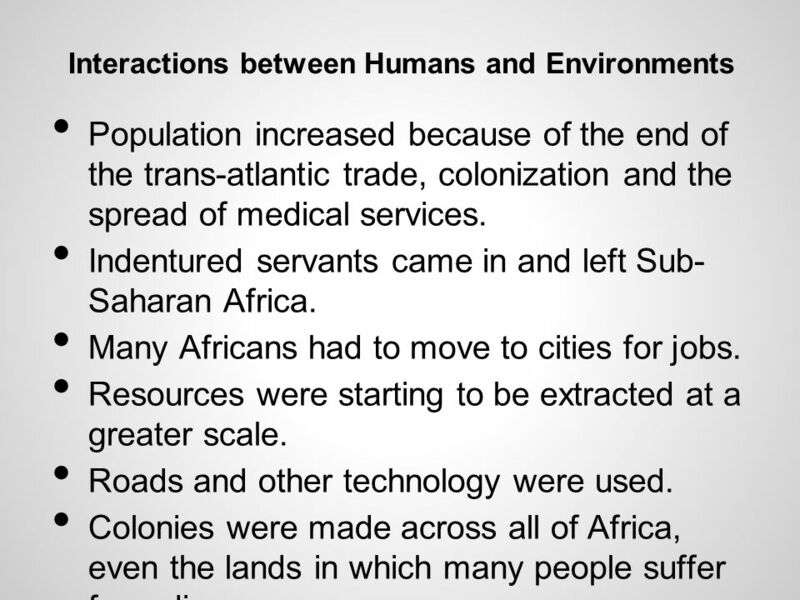 Colonies were made across all of Africa, even the lands in which many people suffer from diseases. 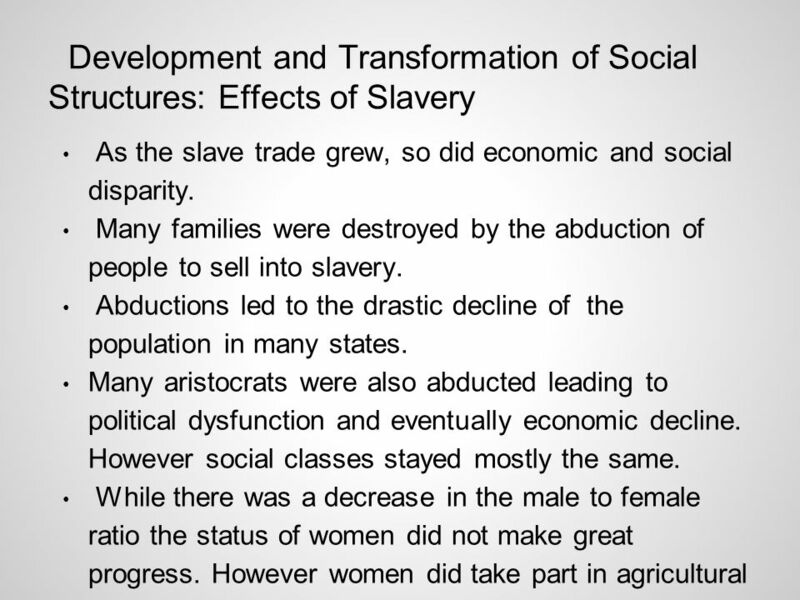 Abolition of Trans-Atlantic slavery led to more Western influence. British were adamant abolitionists and freed many people who were taught Christian ideals Freed blacks returned to their homeland and brought Western culture with them. 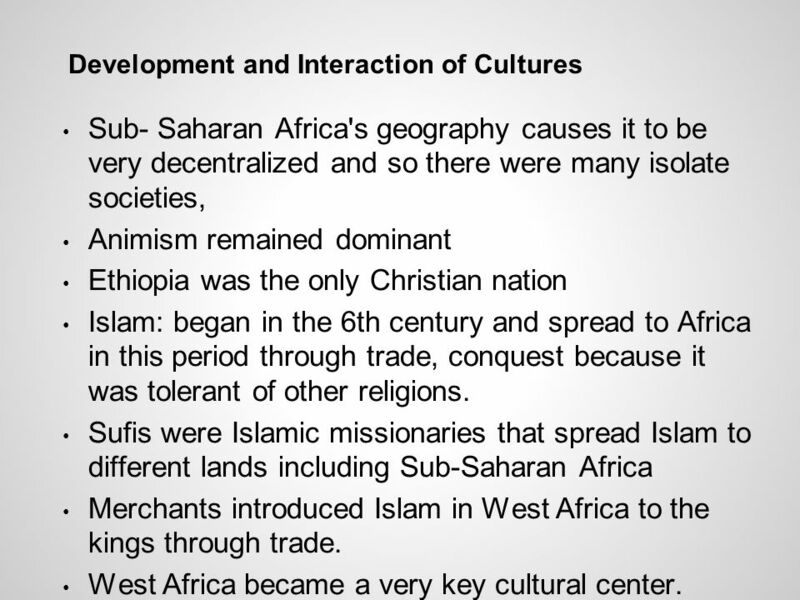 Christianity spread through mission schools European imperialism allowed for Muslims to settle in new places, and so Islam spread peacefully farther. 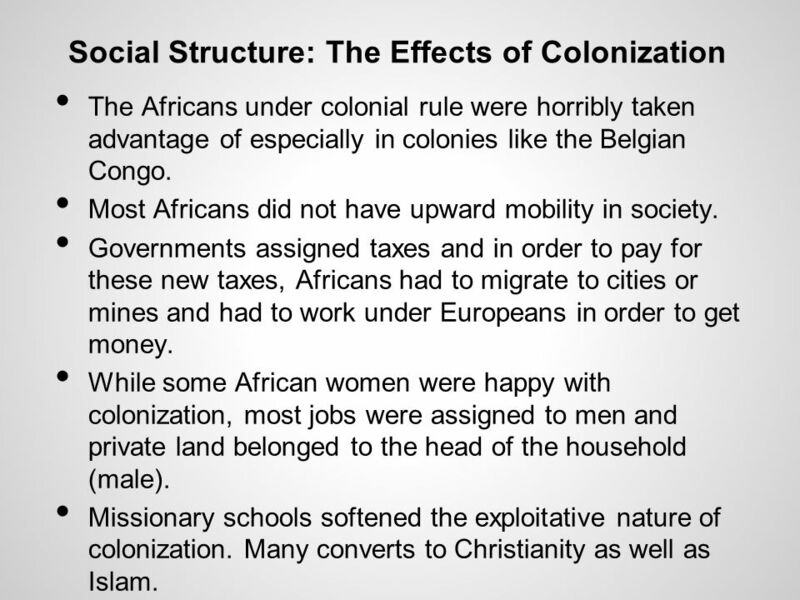 The Africans under colonial rule were horribly taken advantage of especially in colonies like the Belgian Congo. Most Africans did not have upward mobility in society. 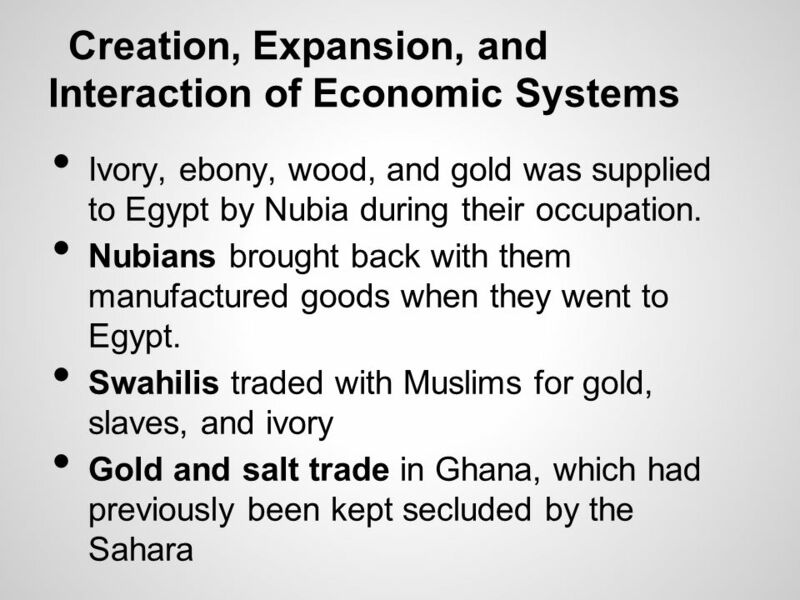 Governments assigned taxes and in order to pay for these new taxes, Africans had to migrate to cities or mines and had to work under Europeans in order to get money. While some African women were happy with colonization, most jobs were assigned to men and private land belonged to the head of the household (male). Missionary schools softened the exploitative nature of colonization. Many converts to Christianity as well as Islam. There was a modernization of the country which gave new technology. 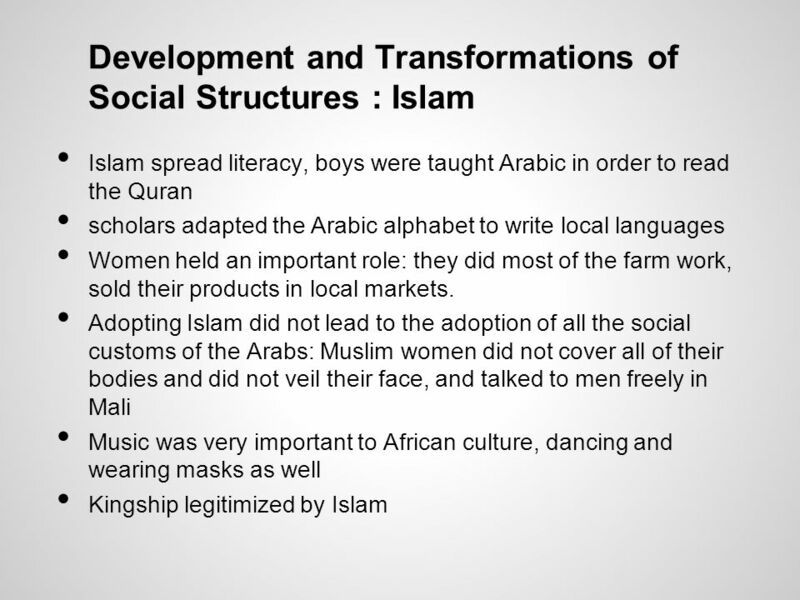 They were exposed to many Western ideas and tools and began gaining things like pools, hotels, cars, etc. During colonialism many new paved roads were being made to connect different places in the country. 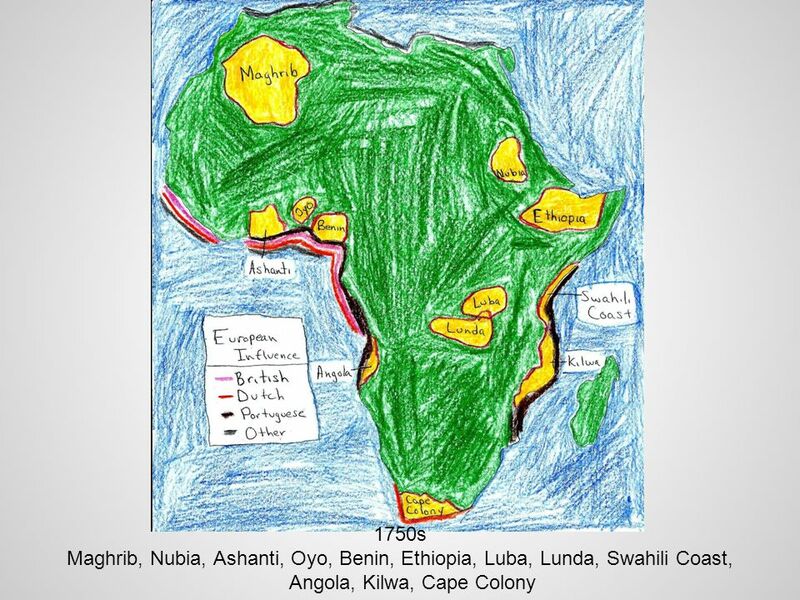 Mining was also big as there were many natural resources in Africa. Vaccines also helped eliminate how many people died from disease in Africa. No longer would people be at so high a risk of dying from things like Malaria and Aids. Religious beliefs stayed the same. 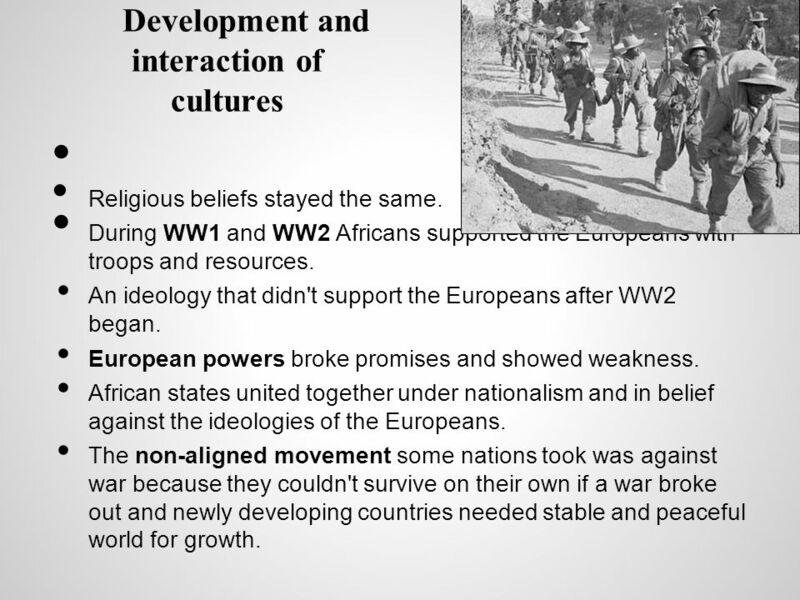 During WW1 and WW2 Africans supported the Europeans with troops and resources. An ideology that didn't support the Europeans after WW2 began. European powers broke promises and showed weakness. African states united together under nationalism and in belief against the ideologies of the Europeans. The non-aligned movement some nations took was against war because they couldn't survive on their own if a war broke out and newly developing countries needed stable and peaceful world for growth. 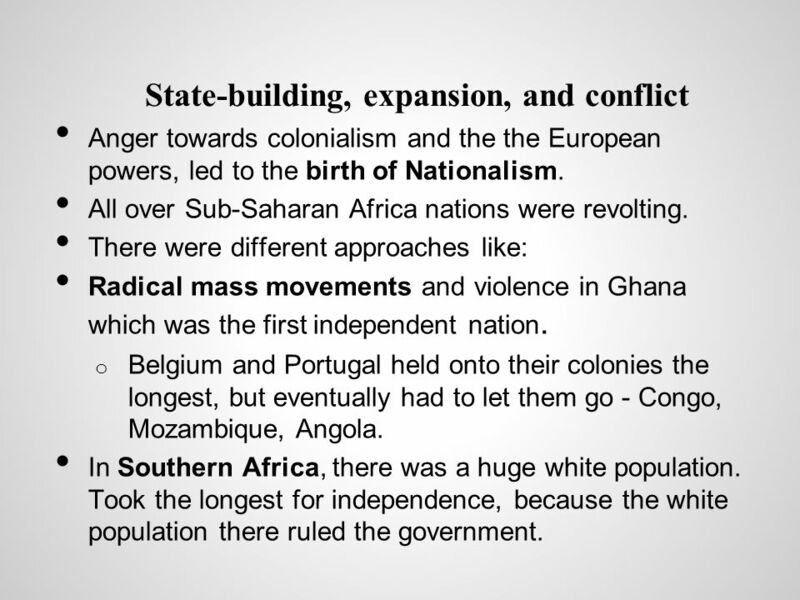 Anger towards colonialism and the the European powers, led to the birth of Nationalism. 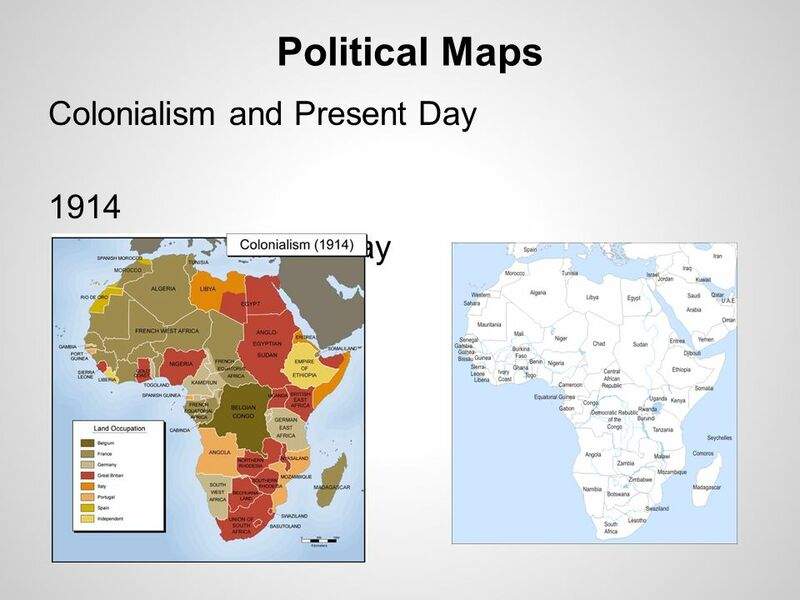 All over Sub-Saharan Africa nations were revolting. There were different approaches like: Radical mass movements and violence in Ghana which was the first independent nation. Belgium and Portugal held onto their colonies the longest, but eventually had to let them go - Congo, Mozambique, Angola. In Southern Africa, there was a huge white population. Took the longest for independence, because the white population there ruled the government. After gaining independence nations wanted to create democratic societies. Some nations like Ghana, didn't think capitalism would work and leaned towards socialism. 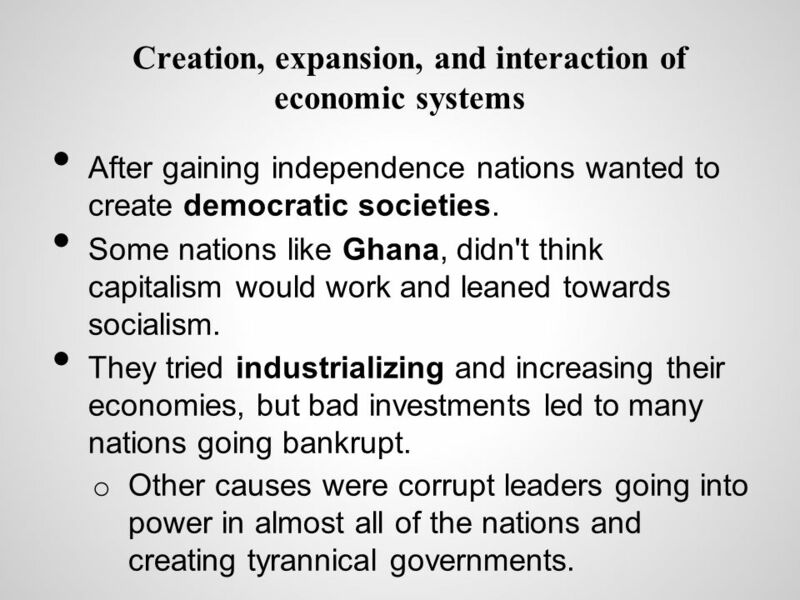 They tried industrializing and increasing their economies, but bad investments led to many nations going bankrupt. Other causes were corrupt leaders going into power in almost all of the nations and creating tyrannical governments. 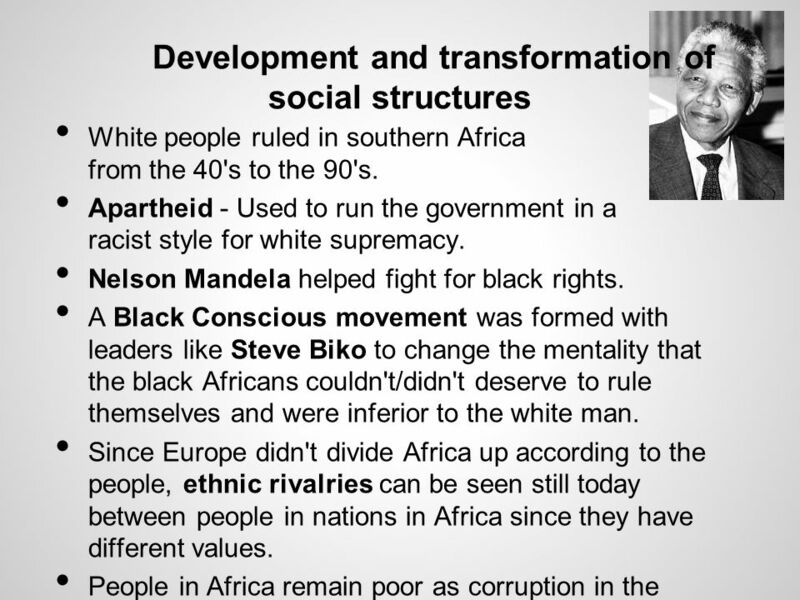 White people ruled in southern Africa from the 40's to the 90's. Apartheid - Used to run the government in a racist style for white supremacy. Nelson Mandela helped fight for black rights. A Black Conscious movement was formed with leaders like Steve Biko to change the mentality that the black Africans couldn't/didn't deserve to rule themselves and were inferior to the white man. Since Europe didn't divide Africa up according to the people, ethnic rivalries can be seen still today between people in nations in Africa since they have different values. People in Africa remain poor as corruption in the government has ruined their economies. 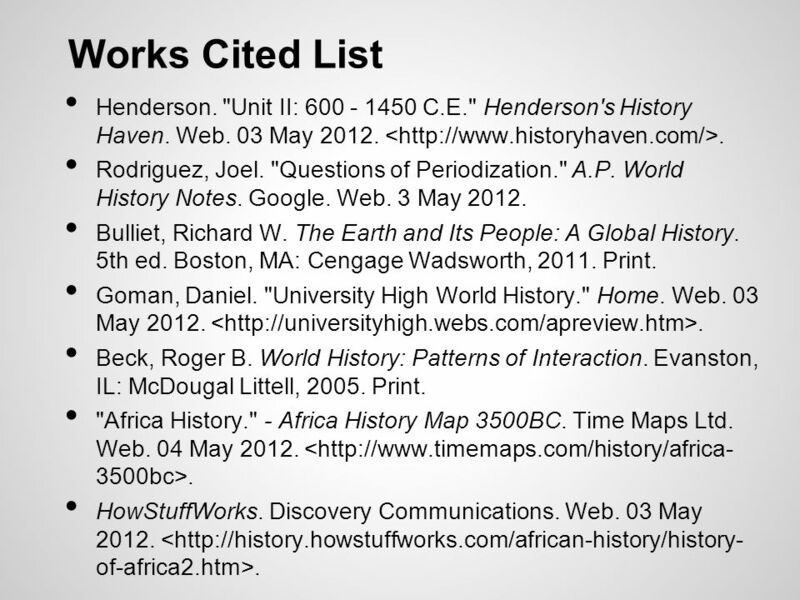 47 Works Cited List Henderson. "Unit II: C.E." Henderson's History Haven. Web. 03 May < Rodriguez, Joel. "Questions of Periodization." A.P. World History Notes. Google. Web. 3 May 2012. Bulliet, Richard W. The Earth and Its People: A Global History. 5th ed. Boston, MA: Cengage Wadsworth, Print. Goman, Daniel. "University High World History." Home. Web. 03 May < Beck, Roger B. 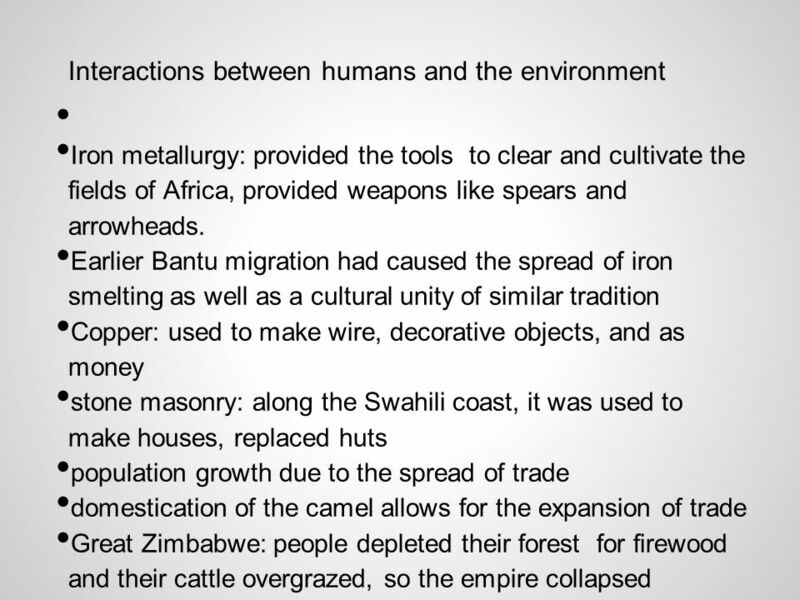 World History: Patterns of Interaction. Evanston, IL: McDougal Littell, Print. 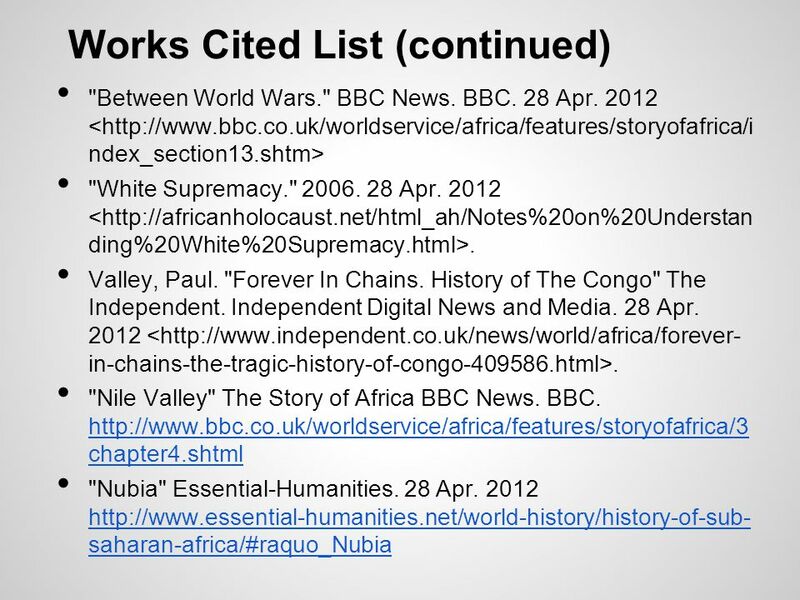 "Africa History." 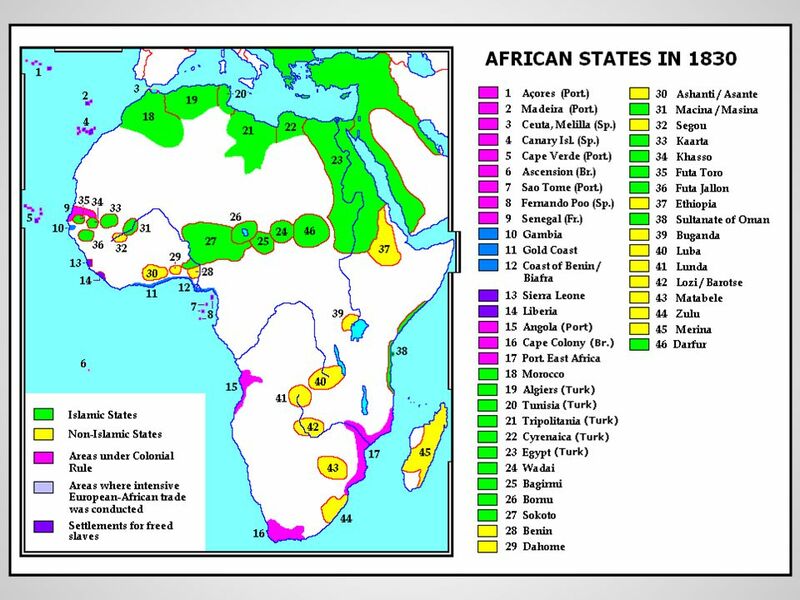 - Africa History Map 3500BC. Time Maps Ltd. Web. 04 May < 3500bc>. HowStuffWorks. Discovery Communications. Web. 03 May < of-africa2.htm>. 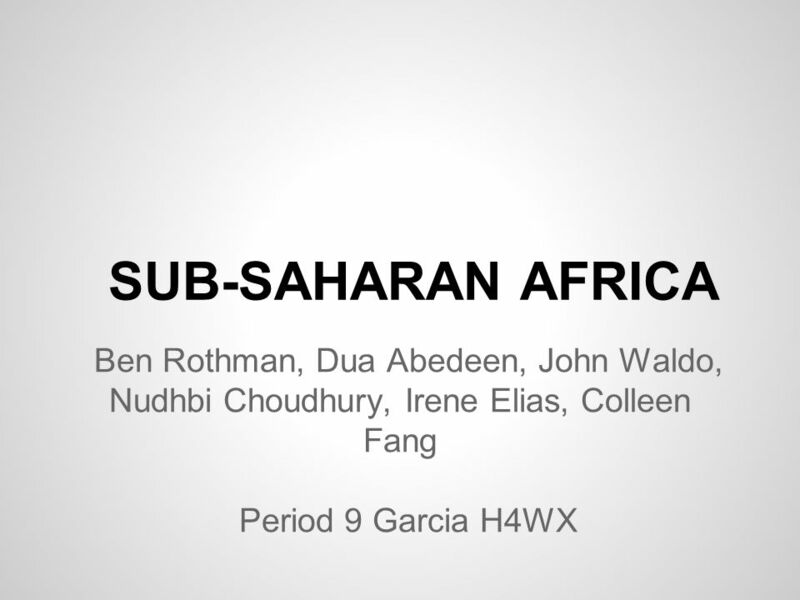 Download ppt "SUB-SAHARAN AFRICA Ben Rothman, Dua Abedeen, John Waldo, Nudhbi Choudhury, Irene Elias, Colleen Fang Period 9 Garcia H4WX." West African Kingdoms Ghana, Mali, & Songhai. 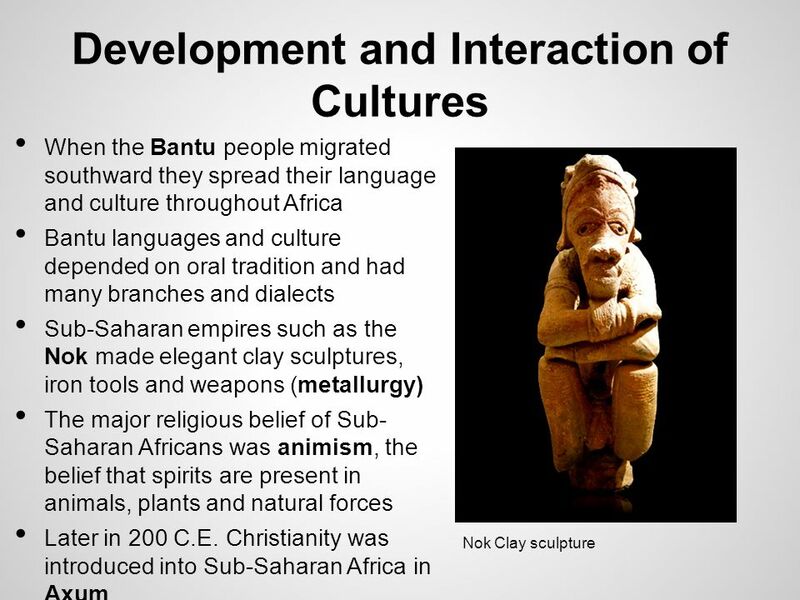 Early Influences Bantu people are the root of most kingdoms in Africa (excluding Egypt) – Originally lived. 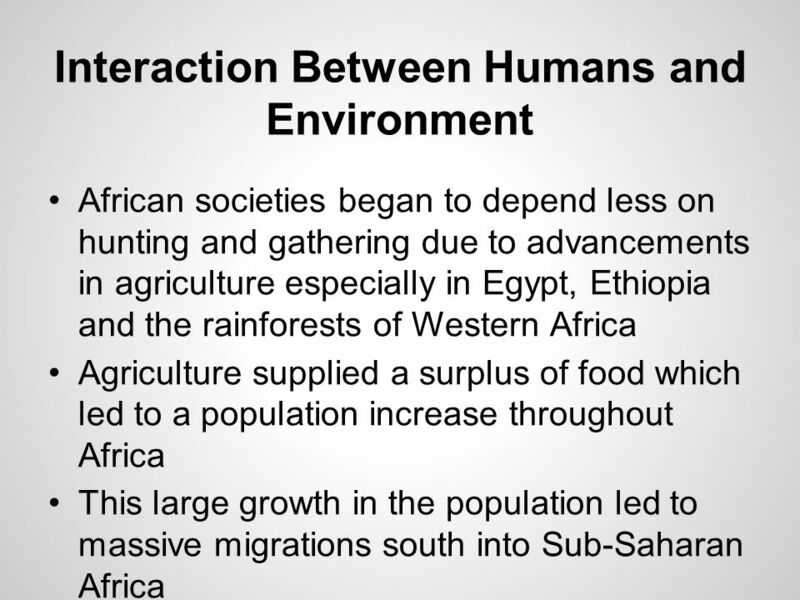 SSWH6 The student will describe the diverse characteristics of early African societies before 1800 CE. 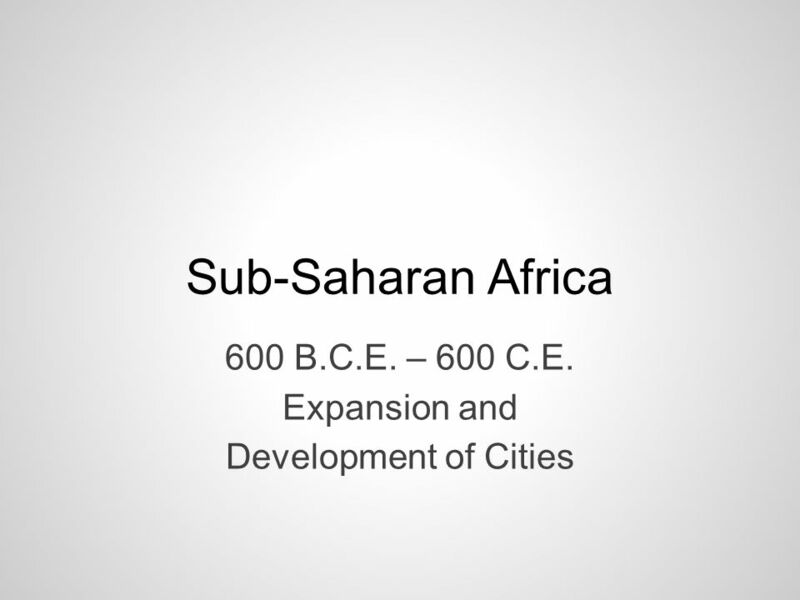 The most significant early civilizations in Africa were Egypt and Carthage. 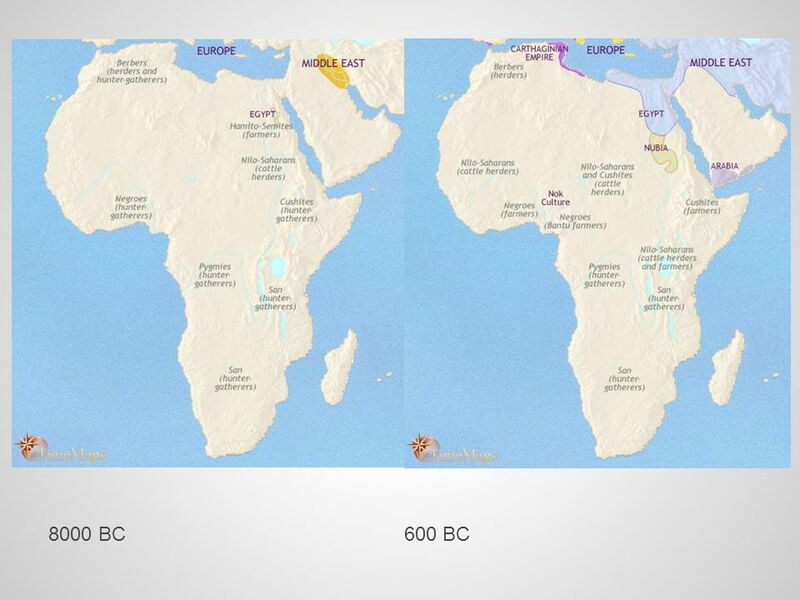 Both civilizations were located in N. Africa, along the Med., N. of the Sahara. Civilization in Africa. I. Africa's Geography Has Many Contrasts LandLand Rain Forest (Congo Basin) near the Equator 1/5th of continent- Hottest & Wettest.